"You must know God’s love for YOU before you will ever love Him – much less people." Is there really a secret to answered prayer? The four Gospels don’t have detailed passages of Jesus’ prayer life. Instead, we get clues and hints in scattered observations by His disciples. They observed that He went off on His own to pray, sometimes all night. We also have a few brief examples of Jesus talking to His Father, such as the verse above. Why didn’t God give us more on Jesus’ life of prayer? What is the difference between Jesus’ prayers, which were answered, and ours? In order to find out the secret to answered prayer, we must first discover what is and is not prayer. This is an essential part of every believers’ journey with the Lord. Do we recognize our Father’s voice? Do we listen to Him when He speaks to us? We are called to love the Lord above all else, yet many of us struggle to even commune with Him honestly, practically, and above all, naturally. This little booklet lovingly shines a light in these very areas before revealing that there actually is a secret to answered prayer! 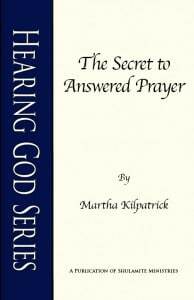 In the Secret to Answered Prayer, Martha Kilpatrick goes to the Bible in search of the deeper truths of Jesus’ life of prayer. There she found treasure in the parables, prayers, and relationships of Jesus, treasure that was meant to be found by all who love God and desire real fellowship with His Son. The Secret to Answered Prayer is available in both print and digital format. I imagine Jesus and the disciples as they journeyed, often making camp beside the road as they traveled through Israel from city to city, walking many dusty miles. When they stopped for the night, suddenly they would look for Jesus and He would be gone. They learned eventually where He went and why… Luke was especially aware of this pattern in Jesus’ life. “Jesus Himself would often slip away, to the wilderness and pray” (5:16). “He went off to the mountain to pray, and He spent the whole night in prayer to God” (6:12). Only Luke mentioned that it was…“while Jesus was praying the heavens opened” and the Spirit descended (3:21). “While He was praying…” Peter saw He was the Christ (9:18). “And while He was praying,” He was transfigured (9:28). When Jesus joined them again, the disciples could see that His direction was clear and certain. Probably He was aglow with the Presence of the Father. Everything He did was done following prayer. He named His disciples following that “whole night in prayer.” He knew what was going to happen and what He should do because He had prayed. He had heard and He had seen (John 5:19). So we know that Jesus dealt not just in asking-prayer but in answered-prayer. His prayer was heard and God’s answer became a seen reality! “I have nothing” is the beginning of prayer. Need is the motivation of prayer. As long as we think we have something: persuasion, contribution, knowledge, when we have something to give, we won’t be able to pray in the compelling power of poverty. Prayer begins only in utter dependence and absolute poverty. The poor in spirit possess all the dynamic of the kingdom only because they know they have nothing! Oswald Chambers wrote: “The greatest blessing spiritually is the knowledge that we are destitute; until we get there Our Lord is powerless” (My Utmost for His Highest, Nov. 28). The Lord said to me once: “You are wringing your hands and calling it prayer.” Prayer is not worry before the Lord, fretting over your own helplessness and ignorance. Prayer is to not resist that you ARE helpless and ignorant. We can’t fix anything and we don’t know WHAT to pray. “There is a need and I have nothing.” How amazing that nothingness is the first essential of prayer! Helpless to provide. Unable to give. Unable to change yourself. Now you can pray! When you know nothing, can do nothing and possess nothing…then you are ready to pray. Lest we miss the message, Jesus makes very clear the motive of the ‘friend’ rising at midnight to finally give the bread. God does not answer us as ‘friend,’ though Christ is our Best Friend. The relationship of prayer is not that of friends and equals! Prayer is simply and only a relationship with a FATHER! The relatedness of prayer is essentially this: a beloved child—in open-hearted audacity, asking his loving Father for all he needs and happily expects. The Canaanite mother is the living illustration of this parable. She followed Jesus “…with a [loud, troublesomely urgent] cry, begged, have mercy on me, O Lord, Son of David! My daughter is miserably and distressingly and cruelly possessed by a demon” (Mt. 15:21-29 NASB)! Then Jesus insulted her as a Gentile woman, His third ‘No.’ To the Jews a ‘dog’ meant unclean and to be avoided. Then Jesus said to her, “Woman, your faith is great; it shall be done for you as you wish.” And her daughter was healed at once. Jesus held the power to deliver her daughter and ONLY He had the power. Her abandon to her desire brought her down low into the abject humility of seeking God, throwing herself at Jesus’ feet. This mother, through her desperation, received faith from the Spirit for Jesus’ healing power. And more, she received His praise for all time that her faith was exceptional! The parable of the Friend at Midnight yields many secrets. One hidden treasure is that here we have a glimpse into the very secret prayer life of Jesus. He is also the man who prays and demands! Hidden within the story we see that He prays with exuberant, bold impudence, confident as the Son of God that He is heard and answered! While others sleep He is wide-awake, fully aware and pleading for the tragedy and need of humanity! He prays with a persistent love and passion that puts us to shame in our tearless, logical praying. And incredibly, we are to be vessels of that persistent love and audacious asking!